The District of Kitimat is very pleased with the decision that the BC government issued today removing some of the barriers associated with the establishment of an LNG industry in BC. This will promote access for natural gas from BC to be exported as LNG to international markets. This would be a significant boost for the North West, the province, and Canada as a whole. This is a positive step forward for the LNG industry in BC, and the District of Kitimat is looking forward to working with the BC Government, LNG Canada, First Nations groups, other stakeholders as well as the Federal Government to move toward a positive final investment decision in 2018. VICTORIA – As part of a new approach to natural gas development, the British Columbia government is overhauling the policy framework for future projects, while ensuring those projects adhere to B.C.’s climate targets, Premier John Horgan announced today. * Guarantee a fair return for B.C.’s natural resources. * Guarantee jobs and training opportunities for British Columbians. * Respect and make partners of First Nations. * Protect B.C.’s air, land and water, including living up to the Province’s climate commitments. These four conditions form the basis for government’s discussions with LNG Canada, which is moving toward a final investment decision on a project that, if approved, would be the largest private-sector investment in B.C. history. 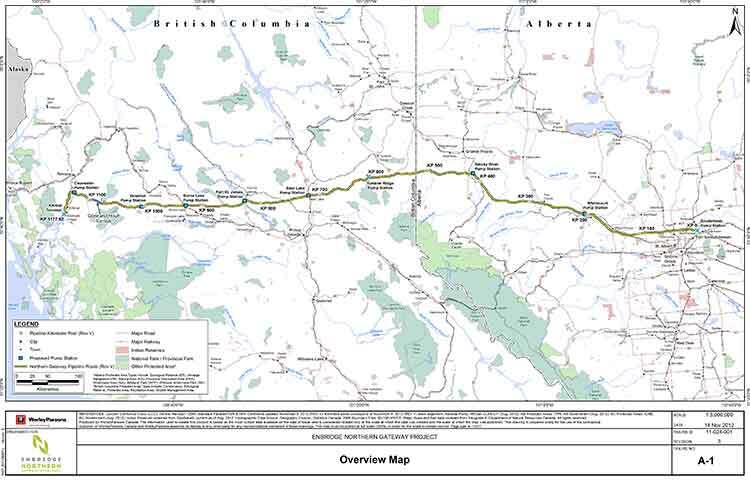 This project would see the construction of a natural gas pipeline from northeast B.C. to Kitimat, where a new terminal will process and ship LNG to Asian markets. It is expected to create up to 10,000 construction and up to 950 full time jobs in northern B.C. At the centre of the discussions with LNG Canada is a revised fiscal framework that is designed to put natural gas development on a level playing field with other industrial sectors, accessing the same fiscal policies and working within the same overall B.C. framework to achieve greenhouse gas (GHG) reductions. * Relief from provincial sales tax (PST), in line with the policy for manufacturing sectors, subject to repayment in the form of an equivalent operational payment. * New GHG emission standards under the Clean Growth Incentive Program, announced in Budget 2018. * General industrial electricity rates consistent with other industrial users in B.C. * Elimination of the LNG income tax that had required LNG-specific tax rates. The Premier said his government will also expect the LNG Canada project to fit within the goals of the Province’s climate-change plan and, specifically, its legislated GHG reduction targets. “We committed, during the election campaign, to reduce our greenhouse gas emissions by 40% below 2007 levels by 2030, and by 80% by 2050. That remains our goal,” Premier Horgan said. With B.C.’s new fiscal framework provided to LNG Canada this week, it is anticipated the company will make a final investment decision sometime before the end of this year. On April 1, 2018, the carbon tax will increase by $5 a tonne annually, until 2022. Increasing the carbon tax meets the requirements set out by the federal government’s pan-Canadian climate framework. Rebates will go to a majority of British Columbians. However, increasing the carbon tax alone will not enable B.C. to meet its long-term greenhouse gas-reduction goals of 40% below 2007 levels by 2030, and 80% by 2050. Significant new climate-action initiatives will be required in order for B.C. to meet these 2050 legislated targets, while encouraging strong economic growth. To ensure an interim target, new legislated targets for 2030 will be introduced later this year. Specific targets for each of the industrial, transportation and building sectors will also be established. Meeting climate targets will not be easy and will require a concerted effort across all sectors to make the transition to a low-carbon economy. The addition of emissions from LNG will increase this challenge but government is committed to taking the steps necessary to achieve B.C.’s climate goals. * A portion of the carbon tax revenue, paid by large industry, will fund a rebate program to incent the use of the greenest technology available in the industrial sector, including the natural gas sector, to reduce emissions and encourage jobs and economic growth. Some of the revenue will also go into a technology fund, to help spur new, clean technologies in all sectors, to make sure they fit within B.C.’s climate plan. * The Climate Solutions Clean Growth Advisory Council (CSCG), established in October 2017, is supporting government’s goal of reducing carbon pollution, preparing for the impacts of climate change and growing a sustainable economy. The CSCG is comprised of community leaders from across British Columbia, including representatives from First Nations, local government, industry, environmental organizations, academia and labour. * The CSCG is providing advice on actions and policies to achieve significant greenhouse gas reductions, while taking advantage of opportunities for sustainable economic development and job creation. * Immediate priorities for the CSCG include achieving emissions reductions in the transportation sector, developing pathways to clean economic growth, as well as policies to support the competitiveness of B.C.’s emissions-intensive and trade-exposed industries. * Government is working to develop a framework for fugitive emissions that match the federal government’s target of a 45% reduction by 2025. * Government is examining every opportunity to reduce emissions from slash burning by providing alternative economic usage for slash where available. * Government has initiated a scientific review of hydraulic fracturing aimed at ensuring that industry in B.C. operates according to the highest-possible standards. Natural gas has a key role to play to provide clean, reliable, affordable and less-carbon-intensive options to global energy markets. British Columbia has a vast supply of low carbon-intensive natural gas resources in places like the Montney Basin, and has been developing them to support economic growth and job creation at home for decades. B.C. natural gas is an important transition fuel that can help B.C. move to a lower-carbon economy. While B.C. has been exporting natural gas to U.S. markets for decades, it has an opportunity to export the same fuel to other jurisdictions. To that end, government will introduce a fiscal framework that will provide fair returns to both British Columbians and investors, as well as a climate strategy that will allow B.C. to meet its legislated climate targets. Despite the cancellation of Pacific Northwest LNG, Aurora and Woodside project proposals, several other LNG proponents have expressed renewed interest in developing projects in BC. LNG Canada’s proposed Kitimat project, should it proceed, represents a very significant economic opportunity for British Columbia – a project that involves one of the largest private sector developments in B.C. history. Shell and its joint-venture partners have worked constructively to satisfy the provincial government’s conditions for LNG, and British Columbia expects LNG Canada will continue to do so moving forward. LNG Canada is also working to achieve global leadership in low-emissions technology and operations. Chevron and its partners have expressed continued interest in developing its project in northern B.C. and is focusing on the use of new low-emissions liquefaction technology. These come as the Province is completing a climate-action strategy in place that meets the Province’s greenhouse gas-reduction targets – to reduce B.C.’s greenhouse gas emissions by 40% below 2007 levels by 2030, and by 80% by 2050. The B.C. government has developed a new framework aimed at ensuring British Columbians receive a good return for their natural gas resource and proponents receive a reasonable return on investment. As part of this work, British Columbia and LNG Canada jointly conducted a financial analysis of the LNG Canada project. 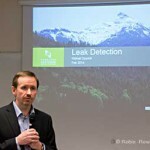 This analysis corroborated evidence and information from internationally recognized LNG analysts that B.C. has a competitiveness issue and formed the basis of a mutual understanding upon which the Province is prepared to commit measures that will increase the competiveness of British Columbia’s LNG industry. These measures provide a framework for other industries in British Columbia in similar circumstances – they are not exclusive to the LNG industry or LNG Canada. As it pertains to LNG Canada, the measures detailed below will only be implemented if the proponents are able to conclusively decide on or before Nov. 30, 2018, to proceed with the construction of the LNG facility and associated investments. These measures below would apply to the entire LNG sector. Under current legislation, proponents constructing significant manufacturing facilities would receive a PST exemption on input costs, whereas those proposing to construct LNG facilities would not. Under the new framework, The B.C. government will exempt LNG Canada from the provincial sales tax (PST), on the construction of their initial proposed facility. This will be conditional on LNG Canada entering into a separate agreement with the province whereby LNG Canada will pay annual operating performance payments over 20 years, a total amount equivalent to what LNG Canada would have otherwise paid in PST during the initial facility construction period. 2. The provincial government recognizes that energy-intensive trade-exposed industries, including the natural gas sector, face unfair competition when competing globally with jurisdictions that do not impose carbon taxes. Proponents who make a final investment decision to proceed will be subject to the new Clean Growth Incentive Program, announced by the provincial government in Budget 2018. A benchmark for world-leading clean LNG production will be established as part of this program, replacing existing requirements under the current Greenhouse Gas Industrial Reporting and Control Act. Proponents who make a positive final investment decision will receive the general industrial electricity rate charged by BC Hydro. This is the same rate paid by other industrial users in British Columbia. The existing LNG income tax is not the most efficient and effective tool for generating returns to British Columbia. It is cumbersome to administer and has led to uncertainties. Government intends to introduce legislation to repeal this tax and instead government will utilize a number other tax and royalty measures under its new fiscal framework, to ensure that British Columbia gets a fair return for its natural gas resource. As part of establishing a new fiscal framework, the provincial government will take steps to improve the transparency and consistency with which it assesses industrial development opportunities. To that end, government intends to introduce legislation to repeal the Project Development Agreement Act, passed by the previous government, to tie the hands of future governments with respect to the rules governing LNG projects. These measures effectively indemnified proponents against changes. Government will also review and potentially cancel or repeal other LNG measures established by the previous government. The second mate of the tug Nathan E. Stewart fell asleep on watch when the tug grounded off Bella Bella, on October 13, 2016, according to an investigation report released by the United States National Transportation Safety Board. 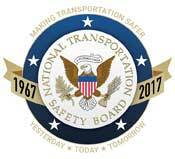 Both the NTSB and the Canadian Transportation Safety Board investigated the grounding. The tug was American owned and crewed while the accident happened in Canadian waters. The TSB investigation on the incident is continuing and no report has been released. The tugboat Nathan E Stewart and the tank barge DBL 55 were connected through the JAK coupling system.1 Controlled from a panel on the tugboat’s bridge, this system uses a 16-inch-diameter, high-strength steel pin pneumatically actuated on each side of the vessel’s bow to lock the vessel into a fitted socket plate welded to each side of the barge’s inner notch. The plates have multiple sockets that run vertically, which allows the tugboat to position itself within the notch to accommodate changing barge drafts as well as to prevent, or minimize, the horizontal movement between the two units. The NTSB says the grounding of the tug caused about $12 million US in estimated damage to the tug itself and the barge it was pushing. 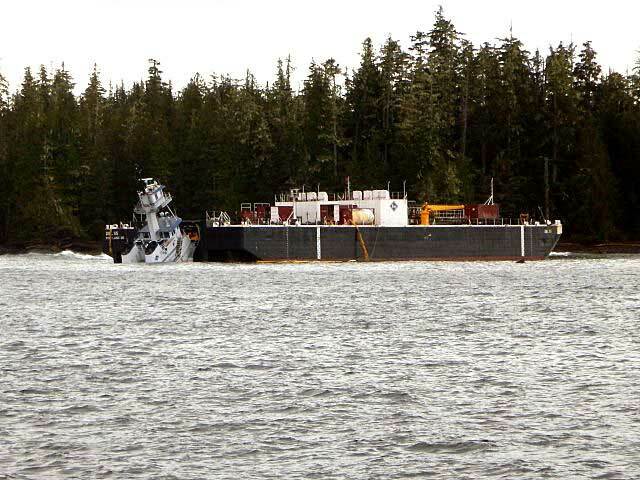 The Nathan E Stewart spilled 29,000 gallons of fuel and lube oil, released into the ocean off Edge Reef, off Athlone Island in Seaforth Channel in the traditional territory of the Heiltsuk Nation. Although no petroleum products were released from the empty fuel barge, a subsequent marine survey found that post accident survey of the DBL 55 found that the barge’s external double hull was significantly damaged from its bow completely aft to the skegs on the stern. There were multiple areas where the hull plating had been inset and penetrated. Some of the framing also had been damaged, but none of the inner steel plating comprising the bottom, sides,or top of the cargo tanks had been breached. The JAK socket plates on the inside of the barge’s notch showed slight damage,with the second recess(fromthe bottom up) on both socket plates indicating scarring and heavy contact. Repair costs for the barge were estimated at $5.6 million. Prior to thegrounding, all the vessel’s vital systems were functional, and there were noindications of a mechanical failure thatmay haveled to the accident. normal practice for the navigation team to not utilize that tool. corrective action to return the Nathan E Stewart to the intended track. Two related scientific papers published in the past two weeks, one on the First Peoples initial settlement of coastal North America and the second giving a probable new timeline of the retreat of the glaciers during the last Ice Age, taken together are likely confirmation of the Haisla story of how that nation first settled the Kitimat Valley. As related in Gordon Robinson’s Tales of the Kitamaat, the First Peoples living on the coast of what is now British Columbia ventured up what is now called Douglas Channel perhaps from either Bella Bella in Heiltsuk traditional territory or from Prince Rupert in Tsimshian traditional territory. The young men on the expedition up the Kitimat Arm spotted what they thought was a huge monster kilometres ahead with a large mouth that was constantly opening and closing. The sight was so terrifying that the men fled back to their homes and dubbed the Kitimat Arm as a place of a monster. Later a man named Hunclee-qualas accidentally killed his wife and had to flee from the vengeance of his father-in-law. Knowing he had to find a place where no one could find him, he ventured further up the Kitimat Arm. There he discovered that the “monster” was nothing more than seabirds, probably seagulls, perhaps feasting on a spring oolichan run. He settled along the shore of what is now the Kitimat River and found a land of plenty, with fish, seals, game as well as berries and other natural products of the land. Eventually he invited others to join him, which began the Haisla Nation and he became their first chief. Let’s examine the new evidence so far. It’s now fairly certain that the First Peoples first began to settle along the coast by following the “kelp highway” perhaps as early as 18,000 years ago and certainly by 14,000 years ago. 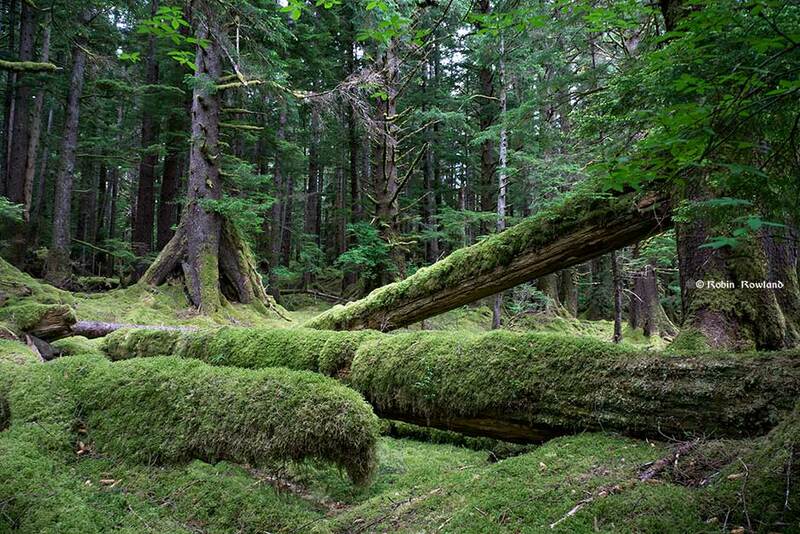 Haida Gwaii was ice free, except for some mountain glaciation as early as 16,500 years ago. At about 14,500 years ago there was a warming spell which forced the glaciers to retreat, brought higher sea levels and the arctic like tundra ecosystem would have been replaced, at least for a time, by forests. There is the discovery of a Heiltsuk settlement dated to 14,000 years ago. At that time almost all of the coast would have been free of glacial ice but there were still glaciers in the fjords, including the Kitimat Arm which would mean there could be no permanent settlement in the “inland coast” and the interior. The cooling periods (with occasional warmer times) from about 14,000 years ago to about 11,700 years ago meant that settlement would largely have been confined to the coast for about two and half millennia. The culture of the coastal First Peoples would have been well established by the time the glaciers began the final retreat. (Remember that it is just 2,000 years from our time in 2017 back to the height of the Roman Empire under Augustus Caesar). It is likely that the cooling periods also meant that some descendants of initial settlers likely headed south for relatively warmer climates. Rising sea levels meant that the initial settlement villages would likely have been abandoned for higher ground. At the end of what geologists call the Younger Dryas period, about 11,500 years ago, the climate warmed, the glaciers retreated further, in the case of Kitimat, first to what is now called Haisla Hill, then to Onion Flats and finally to Terrace. The most important confirmation of the story of Hunclee-qualas’s exile is the account of the monster, the birds and the oolichan run. The new scientific evidence, combined with earlier studies, points to the fact that the glacial melt water carried with it huge amounts of glacial sediment that created vast river deltas in coastal regions of the Northern Hemisphere. That means around 10,000 years ago, when the Kitimat Valley was ice free and the new forest ecosystem was spreading up the valley, the Kitimat River estuary was likely to have been much larger than today. 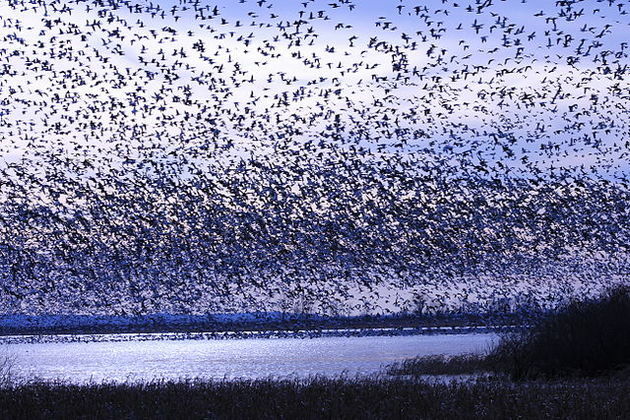 It could have been a vast delta, which would have quickly been repopulated with fish, including salmon and oolichan. 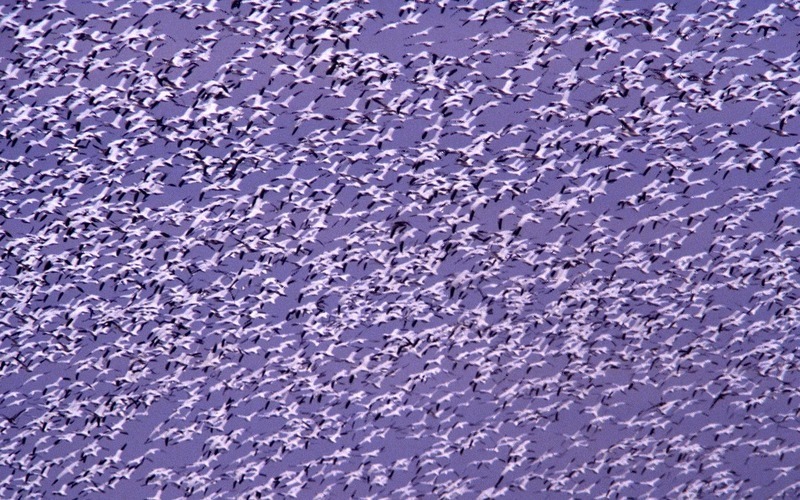 That rich delta ecosystem could have supported a much larger population of seabirds than the smaller estuary in recent recorded history. The First Peoples had had well established communities for up to four thousand years before the Kitimat Valley’s metres of thick ice had melted away. For the first period, while the ecosystem regenerated, for the people of the coast coming up Douglas Channel to the valley would not have been worth it, there would be little to find in terms of fish, game or forest resources. Eventually as the forest regenerated, the streams filled with salmon and oolichan; the bird population including gulls, geese and eagles, found a new feeding ground; bears, deer and other animals arrived. The Kitimat region would have been an attractive place to explore and hunt. It may be the monster story did keep people away until Hunclee-qualas had to find a place to hide and discovered a new home just at a time that might be called an ecological optimum with new forests stretching back along the valley to what is now Terrace. If a vast Kitimat River delta did stretch further down the Channel than it does in 2017, it likely shrank back in the subsequent millennia. Eventually the mass of glacial sediment that came downstream after the retreat of the ice would diminish, but not stop entirely. The estuary is still rebuilt from sediments washed downstream but that sediment doesn’t match other rich deltas elsewhere such as the Nile in Egypt. With that regeneration of the delta slower and smaller than in the first centuries of Haisla settlement, at the same time the land surface rebounded from the weight of the ice, perhaps creating the Kildala neighborhood. The ocean level rose, drowning and eroding part of the old delta, creating the estuary we know today. While waiting for further evidence from archaeology and geology it is safe to say that the stories of the monster and later Hunclee-qualas’s discovery of the Haisla homeland are even more compelling than when Gordon Robinson wrote Tales of the Kitamaat. We can now speculate that there was once, stretching from Haisla Hill far down the Channel, a vast, varied rich, river estuarine delta that supported hundreds of thousands of seabirds, which if they took the wing in unison, would have made those unwary travelers millennia ago, really think that there was a giant monster waiting to devour them at the head of the Kitimat Arm. If some travellers, perhaps about 12,000 years ago, had headed up what is now called Douglas Channel, around the north end of Hawkesbury Island they likely would have seen a glacial retreat driven by a warming planet, something very familiar to the television viewers of 2017, video of 21st century coastal Greenland, where massive glaciers are calving ice bergs into the ocean. The history of rapid glacial retreat over several thousand years from the interior and coastal British Columbia at the end of the last Ice Age is now becoming a crucial indicator of what may happen to both Greenland and the Antarctica. Under the current ice sheets both Greenland and parts of Antarctica are mountain ranges similar to those here in British Columbia. According to new research published to today in Science, that may indicate what could happen as those ice sheets melt and how that will affect volatile climate change. 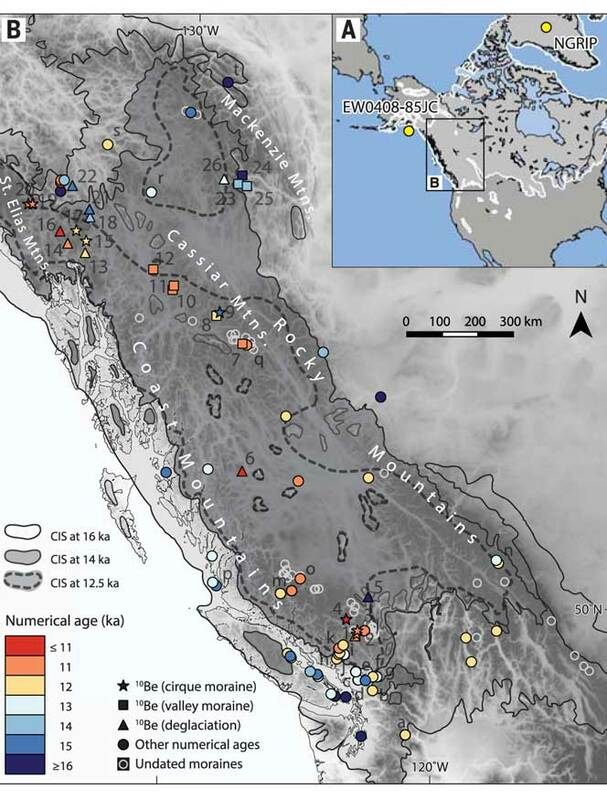 The paper written by Brian Menounos of the University of Northern British Columbia and co-authors indicates that the glacial retreat in BC was faster than previously believed, beginning about 14,000 years ago. That left some parts of coastal and western BC ice free, rather than beginning 12,500 years ago as previously estimated. The last Ice Age probably reached its maximum coverage about 20,000 years ago. The decay of the ice sheet was complex, partly due to presence of mountainous terrain and also because Earth’s climate rapidly switched between cold and warm conditions during the end of the last Ice Age. One of the factors that may have triggered a climate change back to colder conditions was a massive outflow of cold, fresh water from coastal British Columbia, which may have affected ocean currents. What geologists call the Cordilleran ice sheet once covered all of present-day British Columbia, Alaska and the north Pacific United States. How the Cordilleran ice sheet responded to climate change was different from the Laurentide ice sheet which covered the flatter terrain (prairie and the Canadian Shield) of central North America. The Cordilleran ice sheet is about the same size as the current Greenland ice sheet. 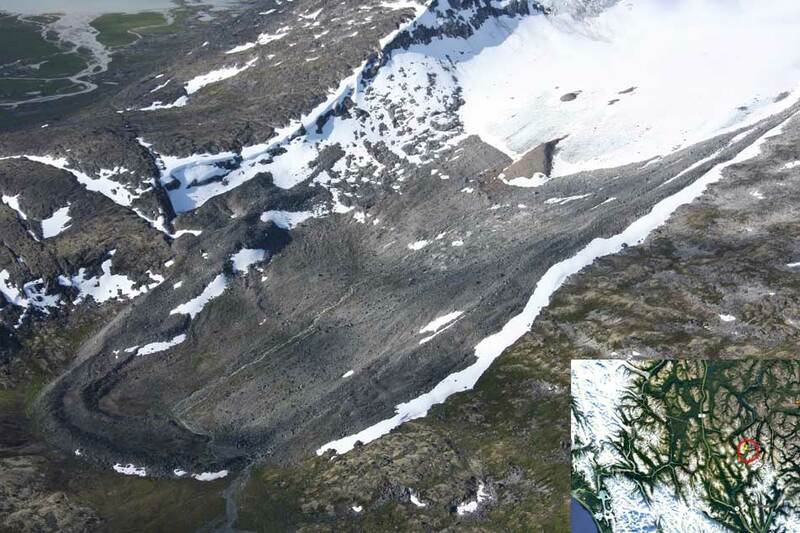 Menounos, the Canada Research Chair in Glacier Change, teamed up with 14 co-authors from Canada, the United States, Sweden, Switzerland and Norway to produce the paper titled Cordilleran Ice Sheet mass loss preceded climate reversals near the Pleistocene Termination. 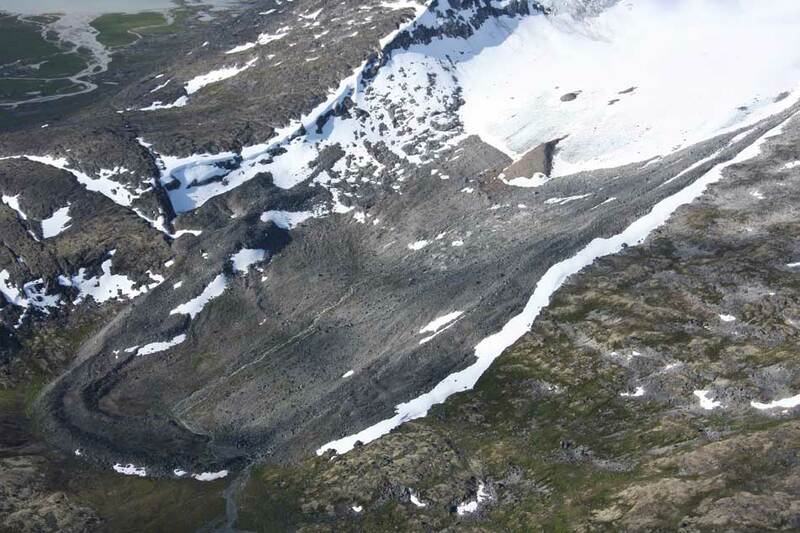 One of the co-authors of the paper is John Clague, now a professor emeritus of Earth Science at Simon Fraser University who studied the glaciation patterns in the Kitimat valley and Terrace in the 1970s when he worked for the Geological Survey of Canada. 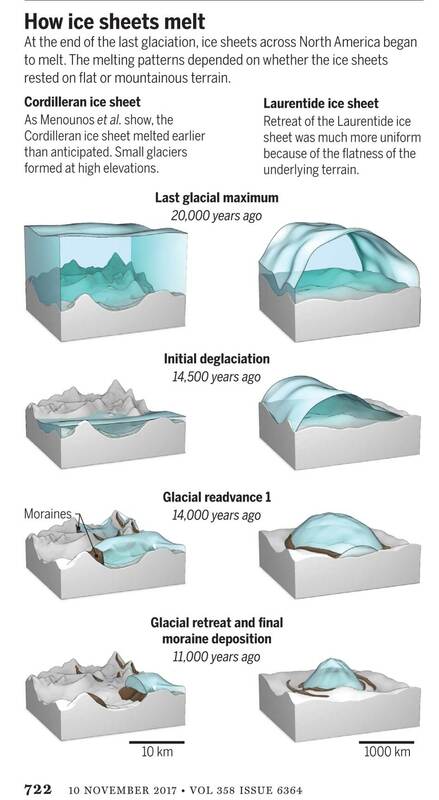 Earlier researchers, including Clague, relied on radiocarbon dating to establish when the ice sheets disappeared from the landscape. The problem is that radiocarbon dating may not work in higher alpine regions where fossil organic matter is rare (above the tree line). Menounos and the researchers used surface exposure dating – a technique that measures the concentration of rare beryllium isotopes that accumulate in quartz-bearing rocks exposed to cosmic rays – to determine when rocks first emerged from beneath the ice. If the rocks are under an ice sheet that means they are not exposed to cosmic rays, and thus measuring the beryllium isotopes can indicate when the retreating ice exposed the rocks to the cosmic rays. The scientists studied small “cirque moraines” found only beyond the edge of modern glaciers high in the mountains, and valley moraines. Most of the work of the team was done in the interior of British Columbia, the Yukon and Northwest Territories. Menounos says that new, similar work is being done on the mountains of the coastal region which will be published when the research is complete. At its maximum, the Cordilleran ice sheet likely extended from what is now the mainland coast across Hecate Strait to the east coast of Haida Gwaii. Starting about 14,500 years ago, the planet entered a phase of warming, with the average temperature rising about 4 degrees Celsius over about a thousand years. The Cordilleran ice began to thin rapidly leaving what the paper calls a “labyrinth of valley glaciers,” which then allowed the alpine glaciers to re-advance. The scientists have suggested the rapid ice loss, beginning 14,500 years ago, came relatively quickly in geological time, perhaps just 500 years. That may have then contributed to subsequent Northern Hemisphere cooling through freshwater rushing into the ocean. That melt water disrupted the overturning ocean circulation of cold and warm water. That led to a new cooling period that lasted from about 14,000 to 13,000 years ago. (Similar to the completely fictional scenario in the movie The Day After Tomorrow, where the cooling happens in days not centuries). Then the climate reversed again, first briefly warming and then in a period that saw another abrupt change back to cooler conditions which geologists call the Younger Dryas, The Younger Dryas occurred beginning about 12, 900 years ago to about 11,700 years ago, when warming began again. The Dryas is named after a wildflower that grows in arctic tundras. The study indicates that the First Peoples could not have settled the interior of what is now British Columbia prior to the Younger Dryas, but it is likely as was explored in a paper last week in Science that the First Peoples were able to come down the “kelp highway” on the coast by at least 14,000 years ago. So what happened in Douglas Channel? So what does the new study of glacial retreat mean for the history of Douglas Channel? John Clague studied the Douglas Channel, the Kitimat Valley and the Terrace area in the 1970s and was one of the co-authors of the current study that provides a new timeline for the retreat of the glaciers on the British Columbia coast. He says that the timeline from his work in the 1970s with radio carbon dating of fossilized organic material is fairly consistent with the new work by Brian Menounos of the University of Northern British Columbia using the beryllium isotope technique. The paper, Clague says, is more of a general commentary on the last stages of the decay of the Cordilleran ice sheet. “At the time we’re taking about in the paper, there was ice in the corridor between Kitimat and Terrace. “What we see in detail based on the work I did ages ago, is the retreat of the glacier from the Kitimat Arm back to the north towards Terrace [in the Young Dryas ]. It occasionally stabilized and the melting ice discharged a lot of sediment into that marine embayment. Based on his original work and the new study Clague says at the time, the mountains are beginning to become ice free but there was still ice in the major valleys such as the Skeena Valley and the corridor south of Terrace towards Kitimat. “They’re overlapping stories.” Clague says. The work seems to indicate that the final ice sheet retreat happened in four stages around 12,000 to 11,000 years ago. “I was interested in the detailed reconstruction of the ice front tracked north from Kitimat you see a number of periods when it stabilized long enough to build up very large deltas and braided melt water plains,” Clague says. The first moraine is Haisla Hill in Kitimat, where the glaciers discharged large amounts of sediment into what is now Douglas Channel. The second is the hill leading to what is called Onion Flats, the third is the flat area where the Terrace Kitimat Regional Airport now is and the final stage of glacial retreat created the “terraces’ around Terrace and Thornhill. At the times the oceans rose at the end of the Ice Age, there were “sea corridors” between Kitimat and Terrace and also in the Skeena Valley. “So you can imagine there were arms of the sea extending to Terrace from two directions almost making that area which is now part of the mainland an island.” But the region likely never did become a true island, Clague says because as the ice sheets retreated,, they were also shedding large amounts of sediment that would become land area at the same time as the earth’s crust was rebounding once it was freed from the weight of the ice sheet. The review paper “The First Americans” was published this week in the prestigious journal Science. Evidence from archaeological sites from the British Columbia coast to the southern tip of South America show that First Peoples had settled on both continents by at least 18,000 years ago, according to authors T.J. Braje at San Diego State University in San Diego, CA; T.D. Dillehay at Vanderbilt University in Nashville, TN; J.M. Erlandson at University of Oregon in Eugene, OR; R.G. Klein at Stanford University in Stanford, CA; T.C. Rick at National Museum of Natural History, Smithsonian Institution in Washington, DC. The paper also says the DNA genomic data suggests a northeast Asian origin for Native American ancestors some time in the past 20,000 years. The land bridge between northeast Asia and North America, commonly called Beringia, came about when sea levels fell during the last ice age. Although the original Beringia hypothesis has been disputed by some First Peoples, the paper says the Beringia hypothesis is still a factor—but much farther back in time, now about 24,000 years ago. 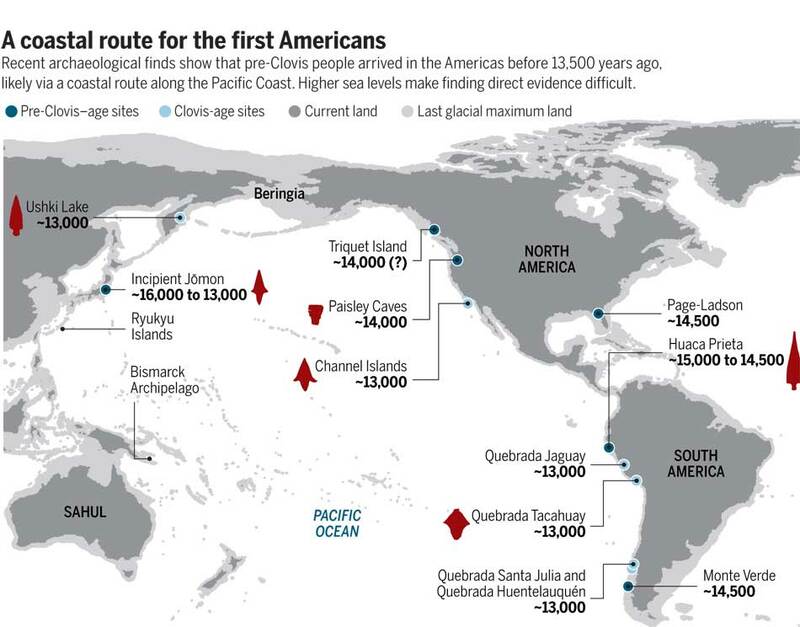 most archaeologists and other scholars now believe that the earliest Americans followed Pacific Rim shorelines from northeast Asia to Beringia and the Americas. The paper says that kelp resources extended as far south as Baja California, and then—after a gap in Central America, where productive mangrove and other aquatic habitats were available—picked up again in northern Peru, where the cold, nutrient-rich waters from the Humboldt Current supported kelp forests as far south as Tierra del Fuego. In an earlier article in Science in August, Knut Fladmark, a professor emeritus of archaeology at Simon Fraser University who was one of the first to propose a coastal migration into the Americas back in 1979, said: “The land-sea interface is one of the richest habitats anywhere in the world,” noting that early Americans knew how to take full advantage of its abundant resources. Testing the kelp highway hypothesis is challenging, the scientists say, because much of the archaeological evidence would have been submerged by rising seas since the end of the last “glacial maximum,” about 26,500 years ago. Although direct evidence of a maritime pre-Clovis dispersal has yet to emerge, recent discoveries confirm that late Pleistocene archaeological sites can be found underwater. Recent discoveries at the Page-Ladson site, in Florida produced 14,500-year-old butchered mastodon bones and chipped stone tools in the bottom of Florida’s Aucilla River. The report says that “Several multidisciplinary studies are currently mapping and exploring the submerged landscapes of North America’s Pacific and Gulf of Mexico coasts, searching for submerged sites. . In British Columbia, those studies (pdf) include the discovery by Daryl Fedje, an archaeologist at the University of Victoria and the Hakai Institute of 29 footprints on Quadra Island. A piece of wood embedded in a footprint’s fill provided the radiocarbon date of 13,200 years ago and the spear points lying and a cluster of bear bones at Gaadu Din cave on the Haida Gwaii dated to 12,700 years ago. The review says that for much of the 20th century, most archaeologists believed humans first colonized the Americas about 13,500 years ago via the overland route that crossed Beringia and followed a long and narrow, mostly ice-free corridor to the vast plains of central North America. There, according to the earlier theories, Clovis people and their descendants hunted large game and spread rapidly through the New World. This was initially confirmed by twentieth-century discoveries of distinctive Clovis artifacts throughout North America. Some finds associated with mammoth or mastodon kill sites, supported this “Clovis-first” model. Now the recent work along the Pacific coastlines of North and South America has revealed that these environments were settled early and continuously, providing a rich diversity of subsistence options and technological resources for New World hunter-gatherers. At the moment, there is little evidence on the coast so far of the kind of stone tools and fishtail points that had previously provided a road map that archaeologists used to trace the spread of “Clovis” Paleoindians throughout the Americas. Such a roadmap is lacking for “pre-Clovis” sites on the coast. One proposal is that distinctive stemmed (“tanged”) chipped-stone projectile points, crescents (lunate-shaped), and leaf-shaped bifaces found in Japan, northeast Asia, western North America, and South America could be potential markers of an earlier coastal migration and ties to Ice Age peoples in East Asia. The problem of finding final proof of the kelp highway is that the First Peoples followed a coastal route from Asia to the Americas, so that finding evidence for their earliest settlements will require careful consideration of the effects of sea level rise and coastal landscape evolution on local and regional archaeological records. 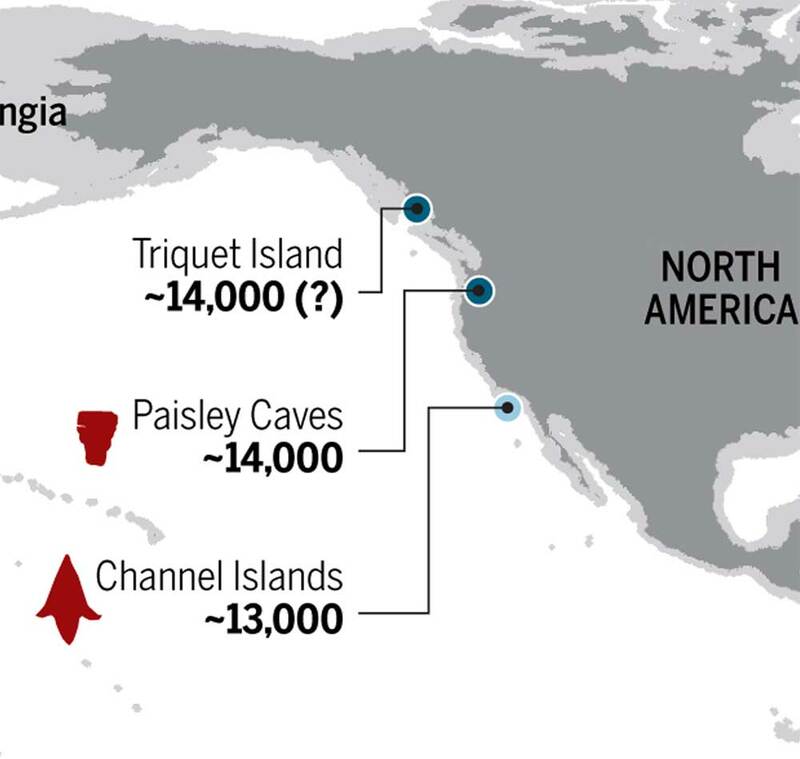 The scientists note that around the globe, evidence for coastal occupations between about 50,000 and 15,000 years ago are rare because of postglacial sea level rise, marine erosion, and shorelines that have migrated tens or even hundreds of kilometers from their locations at the ice age glacial maximum. The staff of the National Inquiry into Missing and Murdered Indigenous Women and Girls will be in Smithers beginning on Monday, July 17 to consult with First Nations and other members of the Highway 16 communities. The full Truth Gathering Process community hearings will begin in Smithers on September 25 for one week. Skeena Bulkley Valley MP Nathan Cullen commented, “The announcement that the National Inquiry into Missing and Murdered Indigenous Women and Girls (MMIWG) will soon stop in Smithers is good news for families along the Highway of Tears who have lost loved ones to violence. At Smithers and other locations the preliminary meetings will allow staff to participate in community visits to lay the groundwork for the hearings as part of the National Inquiry’s Truth Gathering Process. community hearings we may respect and include local protocols and ceremonies. For individuals and families who wish to participate in the hearings, the inquiry has set up a six step process that is outlined on their website. Cullen says he hopes last Thursday’s announcement of the second round of community visits and hearings by commissioners opens the door to a more productive and collaborative process. “There have been many challenges to getting the work of the inquiry off the ground, directly including families in the work, and developing a sufficiently broad mandate to allow real understanding of the deeper issues of violence against Indigenous women and girls,” he said. “The inquiry’s recognition of the need to hold hearings in Smithers is very positive. The immune system genes that protected north coast First Nations from possibly dangerous local pathogens thousands of years ago likely increased their vulnerability to European diseases in the nineteenth century, resulting in the disastrous population crash, a new genetic study has discovered. The study which included members of the Lax Kw’alaams and Metlakatla First Nations at Prince Rupert “opens a new window on the catastrophic consequences of European colonization for indigenous peoples in that part of the world,” the study authors said in a news release. The study, published today in Nature Communications, looked at the genomes of 25 individuals who lived 1,000 to 6,000 years ago in what the study calls PRH—the Prince Rupert Harbour region– and 25 of their descendants who still live in the region today. The study is a follow up to one published in 2013 that used DNA to prove that the remains of a woman from 5,500 years ago was tied directly through the maternal line to members of today’s Metlakatla Nation. “This is the first genome-wide study – where we have population-level data, not just a few individuals – that spans 6,000 years,” said University of Illinois anthropology professor Ripan Malhi, who co-led the new research with former graduate student John Lindo (now a postdoctoral researcher at the University of Chicago) and Pennsylvania State University biology professor Michael DeGiorgio. Both studies were carried out with the consent and cooperation of the Coastal Tsimshian people. The new study analyzes the “exome,” the entire collection of genes that contribute to a person’s traits. The genes, the human leukocyte antigen gene family, known as HLA, helps the body recognize and respond to pathogens, or disease causing bacteria and viruses. Statistical analyses revealed that the ancient genes were under “positive selection” before European contact. Natural selection meant that those ancient people with genetic resistance to those local diseases had an advantage that resulted in the genes becoming part of the population. The “positive selection” genes found in the remains of ancient members of the Coast Tsimshian people, has been replaced by another gene among the modern descendants that “has been associated with a variety of colonization-era infectious diseases, including measles and tuberculosis, and with the adaptive immune response to the vaccinia virus, which is an attenuated form of smallpox,” the authors wrote. One of the genes is “64 percent less common today among the Coast Tsimshian people than it was before original European contact, which is a dramatic decline,” Lindo said. The modern Coast Tsimshian show a “reduction in ‘effective population size’ of 57 per cent,” the researchers reported. The dramatic die-off occurred roughly 175 years ago, about the time that European diseases were sweeping through the First Nations of British Columbia. While some members of the Coast Tsimshian community have intermarried with people of European descent over the past 175 years, the genetic changes cannot be solely attributed to what geneticists call “admixture.” The timing coincides with the documented smallpox epidemics of the 19th Century and historical reports of large-scale population declines. A majority of the “European admixture in the population likely occurred after the epidemics,” the study says. To guard against what the study called “false positives” the genomes were also compared to individuals in the 1,000 Genome Project including 25 Han Chinese from Beijing as well as other indigenous peoples in the Americas including the Maya, the Suruí do Pará people of Brazil and a sample of Anzick DNA from the 12,000 year old remains of a child found buried in Montana. “First Nations history mainly consists of oral stories passed from generation to generation. Our oral history tells of the deaths of a large percentage of our population by diseases from the European settlers. The study says the project was made possible through the active collaboration of the Metlakatla and Lax Kw’alaams First Nations. These results were reported to the community and the scientists continue to visit the First Nations to report on this and related studies. The study is titled “A time transect of exomes from a Native American population before and after European contact” and appeared in the Nov. 15, 2016, edition of Nature Communications. 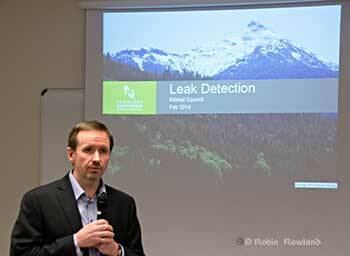 LNG Canada says the Kitimat liquified natural gas project “has been delayed and not cancelled” with a Final Investment Decision possible in the next 18 to 24 months, Director of External Relations Susannah Pierce told a company sponsored community pizza party at Riverlodge on Tuesday October 18, 2016. Pierce said that the current program of site preparation will pause for the winter and holidays in mid-December. After that “work will begin to wind down over the next few months and then we will preserve the site until we are ready to make the Final Investment Decision.” She said LNG Canada is studying ways to make site preservation cost effective. “We are doing everything we can to keep our pencils sharp and keep the community informed so that when the project is approved we are ready,” she added. She pointed out that LNG Canada has already built a fisheries habitat offset in preparation for full development of the site. She said that the Final Investment Decision when it comes will bring opportunities for Kitimat, the province and the whole country. “Everyone in this room and everyone at LNG Canada is working to make this project real,” Pierce said. Northern Gateway pipelines says the company will not appeal the Federal Court of Appeal decision that blocked the approval certificate by the Joint Review Panel and the National Energy Board because there had been insufficient consultation with First Nations. OTTAWA — The federal government is joining Enbridge Inc. in not appealing a Federal Court of Appeal ruling quashing a 2014 Conservative decision to approve the $7.9 billion Northern Gateway pipeline, Postmedia has learned. VANCOUVER, Sept. 20, 2016 /CNW/ – Northern Gateway will not appeal a recent Federal Court of Appeal decision that reversed the project’s federal approval certificate. The Federal Court of Appeal found that the National Energy Board’s Joint Review Panel recommendation was acceptable and defensible on the facts and the law. The Court, however, concluded that further Crown consultation is required. Northern Gateway supports the path outlined by the Federal Court of Appeal for the Federal Government to re-engage with directly affected First Nations and Métis communities to ensure thorough consultation on Northern Gateway is undertaken. “We believe that meaningful consultation and collaboration, and not litigation, is the best path forward for everyone involved. We look forward to working with the government and Aboriginal communities in the renewed consultation process. We believe the government has a responsibility to meet their Constitutional legal obligations to meaningfully consult with First Nation and Métis. It also reflects the first priority of Northern Gateway and the 31 Aboriginal Equity Partners to build meaningful relationships with First Nation and Métis communities and ensure their voice is reflected in the design of the project. We believe that projects like ours should be built with First Nation and Métis environmental stewardship, ownership, support, and shared control. 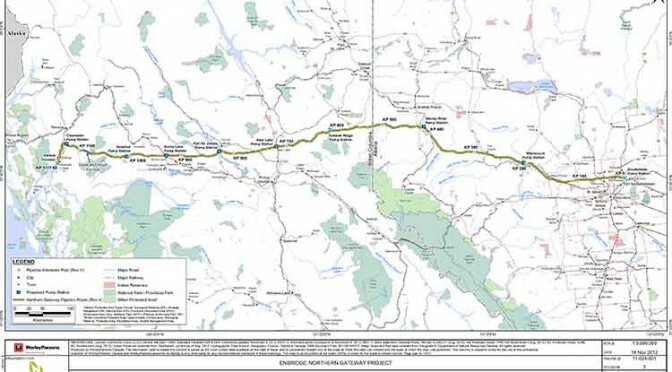 Northern Gateway, the Aboriginal Equity Partners, and our commercial project proponents remain fully committed to building this critical Canadian infrastructure project while at the same time protecting the environment and the traditional way of life of First Nation and Métis and communities along the project route. In order to encourage investment and economic development, Canadians need certainty that the government will fully and properly consult with our nation’s Indigenous communities. We look forward to this process and assisting those communities and the Federal Government with this important undertaking in any way we can. The economic benefits from Northern Gateway to First Nation and Métis communities are unprecedented in Canadian history. As part of the opportunity to share up to 33 percent ownership and control in a major Canadian energy infrastructure project, the project’s Aboriginal Equity Partners will also receive $2 billion in long-term economic, business, and education opportunities for their communities. “We support Northern Gateway’s decision to not appeal the recent decision by the Federal Court of Appeal. This is a reflection of the commitment to the new partnership we are building together and their support of meeting Constitutional obligations on government to consult. The Federal government has publically stated they are committed to reconciliation with First Nation and Métis communities. As such, we are now calling on this same government to actively and fully undertake the required consultation as directed by the Federal Court of Appeal in relation to the Northern Gateway project. The Aboriginal Equity Partners is a unique and historic partnership that establishes a new model for conducting natural resource development on our lands and traditional territories. We are owners of Northern Gateway and are participating in the project as equals. Environmental protection remains paramount and as stewards of the land and water, and as partners in this project, First Nation and Métis communities have a direct role in the environmental protection of the lands, waters, and food sources along the pipeline corridor and in marine operations. Our traditional knowledge, science, and values will be used to design and operate land and coastal emergency response to make the project better. We believe with this project there is an opportunity to work together with the Federal Government to improve marine safety for all who live, work, and depend on Canada’s western coastal waters. This ownership ensures environmental stewardship, shared control, and negotiated business and employment benefits. Collectively, our communities stand to benefit from more than $2 billion directly from this Project. Our communities need the economic and business benefits that Northern Gateway can bring. We are focused on ensuring our communities benefit from this project and are actively involved in its decision making so we can protect both the environment and our traditional way of life through direct environmental stewardship and monitoring.